Me with my IM Canada training buddies, Sarah and Monika at the race finish. Got my favorite recovery drink, chocolate milk, in hand. I made some bad choices here. My race plan was to hold back for 5 miles before picking up the pace. This might have worked had I been in a race corral with people that were running 10:30 minute miles at the start but somehow I got in a corral with people shooting for a 2:30 half marathon so our starting pace was closer to 11:30. 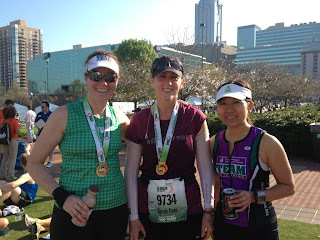 I still wasn't sweating it too much because I had some slight shin splint issues that have been troubling me and they were acting up at the race start. I knew that would wear off around mile 3 and it thankfully did. I also knew from the moment I got into my corral that I was going to have to make a bathroom start somewhere early in the race. It may be TMI - but there is no desire for a PR that will keep me from the comfort of an empty bladder. So Sarah and I made a pit stop around mile 3 and I stopped my watch so I would know what my official time would have been without the stop. Unfortunately when I adjusted my race belt after coming out of the port a potty it must of somehow jostled my Omnipod and the cannula shifted into an irritable area. For the rest of the race I had some pain in that area and it occasionally must have bumped directly into a nerve because the pain would get really sharp. I thought about taking the pod off for a short time but didn't want to do that as it is a big waste of my money to take off a pod that is otherwise functioning properly. I did have to take off a pod a few weeks ago that must have been resting directly on a nerve so I knew the pain wasn't at the same level I had been experiencing on that occasion so I pushed through it. Around mile 5.5 I decided to start pushing and picked up the pace going uphill at the Carter Center. This is where it became really clear that staying in my pre-determined slower corral was a bad move as I spent the rest of the race running around people. I ran on the grass, on the sidewalk, dodging left and right to get through the crowds. I tried as much as possible to never cut sharply in front of anyone so that they had to adjust their pace but still had to do it a few times and gave my apologies whenever possible. I did manage to catch up to the 2:15 pace group so I must have made up a good chunk of time though not nearly as much as I hoped. 1) My nutrition plan was right on track! I had no blood sugar issues during the run. I started the race with one PowerBar energy gel so that I got a boost of caffeine and lots of electrolytes and then followed up with a shot from my flask of Raspberry Hammer Gel every 20 to 30 minutes. 1 to 2 cups of water at every water stop. That's actually a pretty big deal and I'm happy about it. 2) I felt GREAT from mile 3 - 9 - at least when my pod wasn't bouncing into a nerve. I was frustrated at having to run around people but it was evident that I was strong compared to those around me. Really that means nothing more than I was in better running shape then the group I was placed in. This is nothing particularly special, it just means that I have gained a lot of strength in this area since last year and my qualifying time for this race (which is what they base your corral placement on) was below my current ability. In the past I have had to take some extended walk breaks late in races at water stops. This is the first race where I only had to take one of these walk breaks around mile 11. After that I was able to pick it up and ran to the finish strong. Lessons learned: don't wait too long to pick it up (should have done mile 3) and if I know that I'm in better shape than is reflected in my corral go ahead and move up so that I don't frustrate myself or those around me. I think doing this race in 2:00 is in my grasp, maybe next year. What is really important is that this was another step towards what is really important this year, Ironman Canada! When I look at it that way, this was a great training day as it confirmed my running nutrition plan. Gorgeous day on a fun and challenging course. Yay, that's awesome! Nutrition is such a hard one to pin down, you did it!!! Big Picture!!! The goal is in August, and not in March! Don't let it get you down! Go train for the big one! Regardless of your time, it important to remember that you are still an inspiration to others.